The previous tutorial explained how to insert page breaks in Word 2010; in this tutorial, we will talk about section breaks, and show you how to add them throughout your documents. A section break is, in effect, a document within a document; in fact, a section-break-less document could be considered a break onto its own. This is the way Microsoft Word allows you to create custom formatting and styles for select sections of your work - like having a memo, a trifold brochure, and an envelope in the very same file, all with their own color, themes, paper and margin settings. Behind the scenes, Word actually creates sections to keep track of different styles you apply to portions of your documents. Select on the "Page Layout" tab in the ribbon. A "Next Page" section break stops the flow of text where it is, and begins a new section on the following page. "Continuous" allows you to add "invisible" breaks in your document, for formatting purposes or others - this break will only be visible in draft view or when you show hidden formatting marks (see tip below). "Even Page" and "Odd Page" section breaks are especially useful for documents where exact pagination is important, like books and brochures. Any content following an "even page" section break will add a blank page and flow to the next one if it were to fall on an odd page (gives full control over appearance on recto or verso). Another, special section break doesn't appear in the menu pictured above, and is designed for multi-column documents: a "New Column" break will guarantee that text and images following it start a new column. Insert any other section break where you want a new column to start, and click after that break: then, change section type manually to New Column (see below). 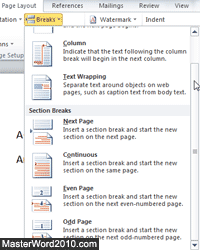 Tip: there are two ways to view section breaks in Word 2010 documents. Switch to "Draft View" by clicking its icon in the status bar (lower right corner). Select the "Layout" tab in the dialog, pick another break type under "Section start", and click "OK". Press Ctrl+Shift+8 (same as Ctrl+* ) to show formatting marks (or switch to Draft View), and select your section break; hit Delete or Backspace, and make sure to delete any remaining leading or trailing spaces: the section after will now use the same formatting as the section preceding it. If you feel both confident and familiar enough with your document, you can delete these "invisibly", in Print Layout.